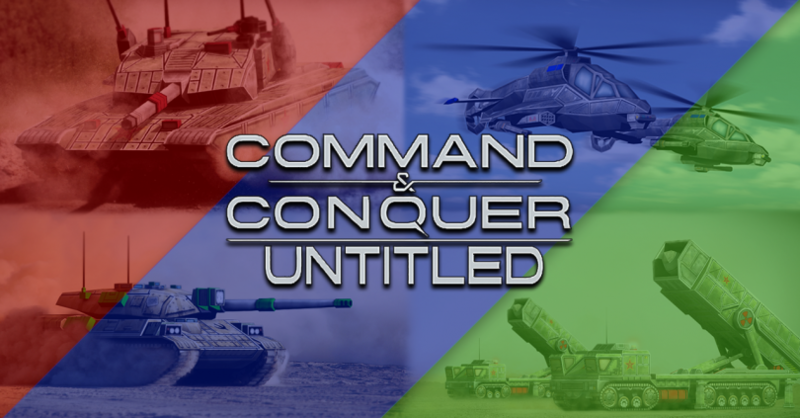 I wanted to have a series where I look at some mods for Command & Conquer: Generals - Zero Hour and showcase what they did with the game. However, after I finished the first spotlight, which can be watched Here and Here And due to life interfering, this was all I could do in the aforementioned form. However, wit my life currently having a bit of a schedule, as well as always regretting not being able to finish this, I've decided to get back into it in a new form, as well as expand with more Generals / Zero Hour mods. Are there mods missing? Hook me up on any of the links posted at the bottom. But guess what? There is STILL more. Once again, if there is a mod you want me to showcase, links down below. Want to suggest a mod? Now onwards with the announcements! 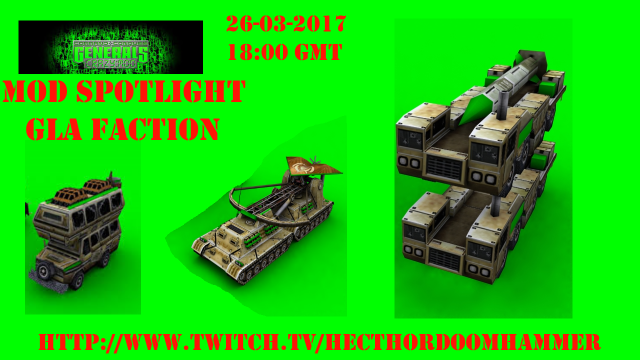 Edited by Hecthor Doomhammer, 08 May 2017 - 11:22 PM. 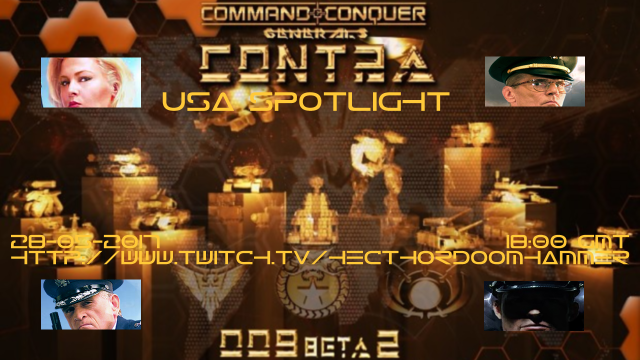 To kick off the return of the Command & Conquer: Mod Spotlights, I'm going to do a first impression showcase of C&C Generals: Crazy Mod as my first Mod to spotlight. 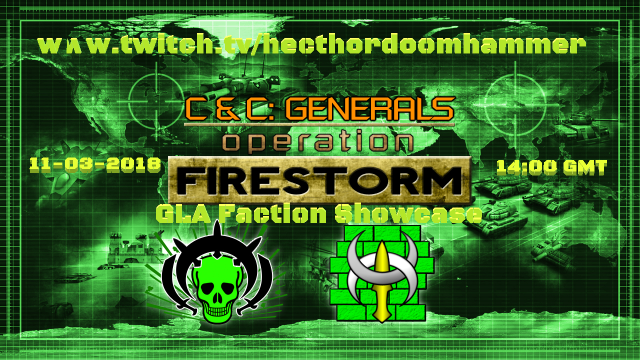 I will do 1 skirmish with each of the Generals to show what crazy units have been put in and we're going to start off with the GLA Faction. 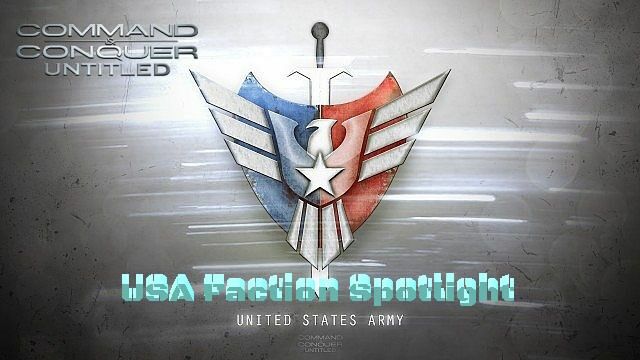 Each week I will showcase 1 entire faction of each mod. 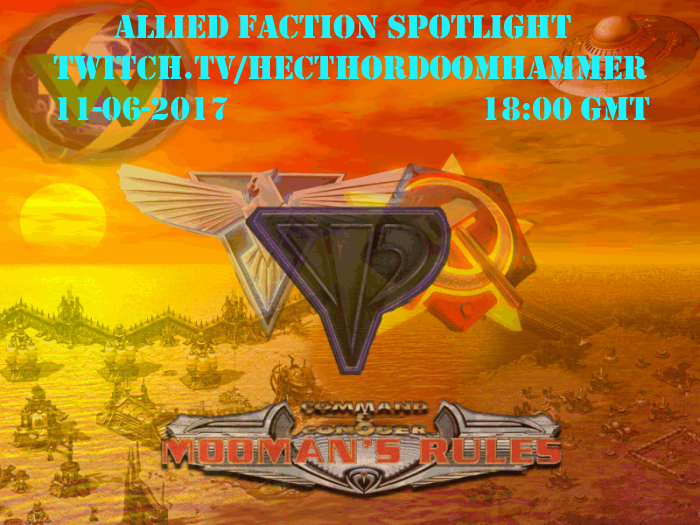 Make sure to tune in, as I will be giving my final verdict of this mod after having seen all that it has to offer. There was a time when I was still playing skirmish in the original Red Alert 2: Yuri's Revenge. A time when I was completely unaware that there was a thing called MODS. That was, until my best friend and his younger brother introduced me to Cannis' Rules. My life was forever changed and now I am here, streaming mods like crazy. 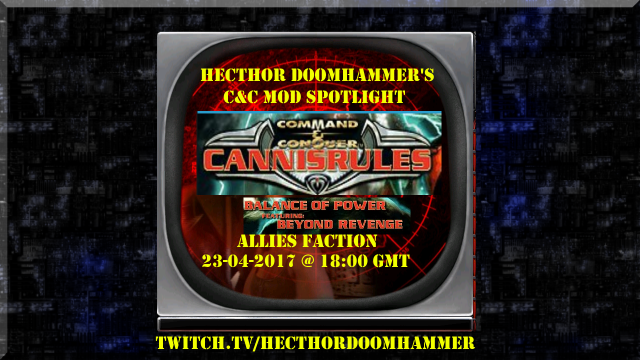 To bring back the long forgotten times I will be shedding a C&C Mod Spotlight on Cannis' Rules, starting tomorrow, April 23rd at 18:00 GMT on my channel on twitch and I will be starting out with the entire Allies Faction. Purely Skirmish, single player and we'll see why this mod has gotten me as far as I am right now. DoomyBot will occasionally put out the link to where you can download the mod and in the Youtube movie descriptions you can find the link too, once the VOD's are uploaded. Hope to see you all relive your memories and I hope to see you all then! 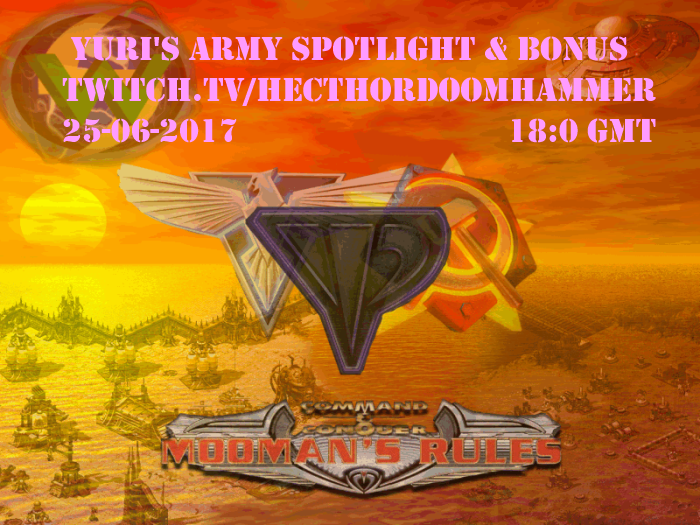 Tomorrow, April 30th 2017 at 20:00 CET / 18:00 GMT I will be streaming on my channel on Twitch with this Command & Conquer: Mod Spotlight! Hope to see you all then to relive the old memories! As Cannis' Rules only has 1 Yuri "country" his would be a very short stream, so I will be giving some attention to a few other game modes today after Yuri is done. Tonight, May 7th 2017 at 20:00 CET / 18:00 GMT I will be going live with the last of the Cannis' Rules Mod Spotlight and at the end I'll be giving my final verdict. Thus far, with the exception of 2 or 3 units I've shown off everything that the GLA and USA have to offer. 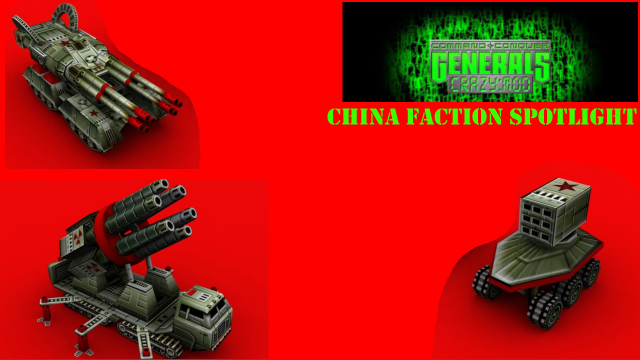 With that, China is the only thing left with its new Flame Weapons General. 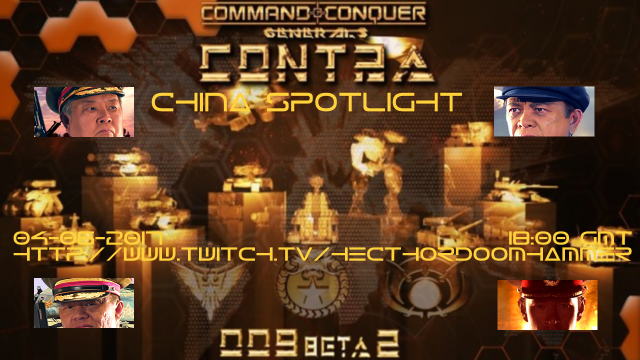 So tomorrow, June 4th 2017 at 18:00 GMT / 20:00 CET I will be diving in blindly to see what the Chinese army has been given in Contra. At the end of this stream, I will be giving my final verdict of this Mod and talk about possible future prospects. So make sure not to miss it. 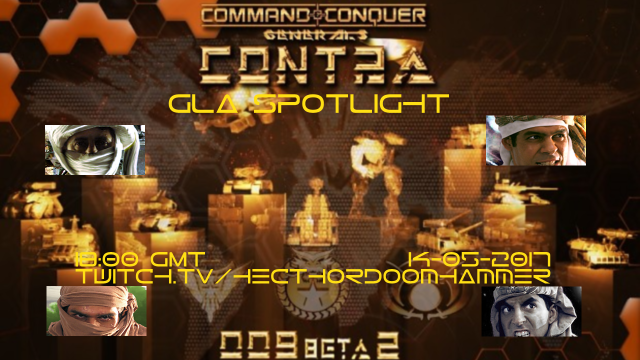 Edited by Hecthor Doomhammer, 10 February 2018 - 05:37 PM.